Cuba’s close to the U.S. geographically, but not necessarily culturally. Our histories sometimes converge, and Columbus played a prominent role in exploring both. 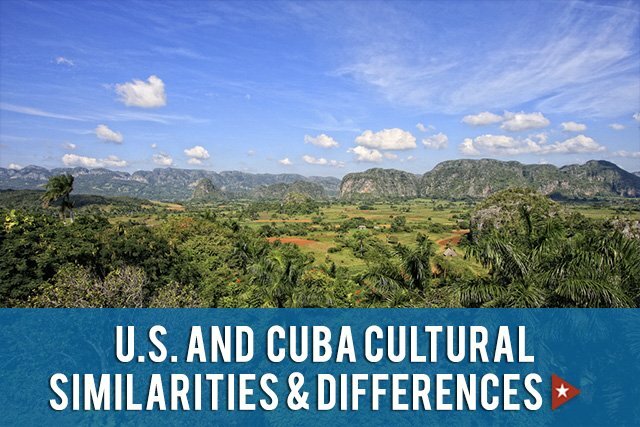 Friendliness abounds in both countries, but Cubans display an especially warm and welcoming spirit. Cuba sees little violent crime. Music and art prevail. Americans may enjoy more material advantages, but Cubans, in general, express happiness with what they have. In Cuba, voters turn out in far greater numbers for municipal, provincial, and national elections. Campaigning, outside of posters and meetings, does not take place. America’s is chiefly a two-party system. Cuba has several parties, but communism dominates. Wages are lower in Cuba, but so are many costs. Interestingly, waiters, chamber maids and others in service professions often earn more than doctors, thanks to tourist’s tips! Cubans receive free healthcare—but doctors and supplies remain limited. The states enjoy a reputation for advanced medical care—but health insurance gaps create debt for many Americans. Both countries experience poverty, but Cuba sees little homelessness. Housing in Cuba is subsidized, and families generally take in members who would otherwise have nowhere to go. This makes the typical Cuban home more crowded than the average American dwelling. (Severe tropical weather has also been known to destroy significant numbers of island homes, further reducing housing options.) Cuba boasts a higher rate of home ownership overall. Cuba’s literacy rate consistently hovers near 100 percent. The country’s universities have been free for generations, and the island boasts a well-educated population. However, recent budget cuts have ended many higher-education programs. Cuba sees little racial strife because the population’s roots are almost equally Caucasian, African, and biracial. The U.S., however, holds a far greater number of ethnic groups. In Cuba, groceries are rationed. Surprisingly, perhaps, American cooking often uses more spice. Vegetarianism is common in the U.S., but rare in Cuba. Past scarcities made meat a valued commodity, and fresh produce, though abundant, has traditionally cost handsomely. This may be changing, though. Too, Cuba’s best-known dishes, many of Spanish and African origins, revolve around pork, beef, or chicken. However, one or two veggie restaurants—notably El Romero in Laz Terrazas—garner consistently excellent traveler reviews, suggesting that meat-free dining may yet catch on. The United States takes up far more land than Cuba. While the island’s temperatures range from warm to hot, weather conditions vary widely across America, and, in most parts of the country, change according to season. In matters of interpersonal communication, Cubans tend to stand closer together than Americans, and speak loudly. Cuban communication includes many gestures. Eye contact is expected. Even relative strangers may use terms of endearment or mild physical contact. Because of the island’s proximity and climatic similarity to Florida, and Miami’s large Cuban population, Miami and Cuba enjoy several cultural similarities. “Spanglish”—a mix of Spanish and English—is often spoken in Miami, and Cuban dishes can be found on many local menus. As Cuba and the U.S. renew our old friendship, Americans seeking adventure are flocking to Cuba. And Cubans, curious about their American cousins, are welcoming them.